One reason why the "core topic" posts started with the classic theories of military strategy is their universal applicability to all types of warfare—interstate and internal, conventional and unconventional, high-intensity and low-intensity. I've already peppered the recent sections on revolutionary strategy with mentions of some of these principles, such as the initiative and the center of gravity. We've reviewed revolutionary strategy enough that we can apply another general principle, the dynamic of measure and counter-measure. Revolutionary strategy (and, by extension, organization) changes within each internal war. At the same time, revolutionaries learn from each other's examples, so revolutionary strategy in general has evolved. Since I've spent a great deal of time distinguishing among Maoist, Leninist, and terrorist strategies, I'll cite several developments that apply to these strategies individually, as well as broader changes that apply to all of them. Probably the most significant development in revolutionary strategy is its increasingly international character. Nearly all internal wars now have an international theater, in which the revolutionaries and the regime battle for influence over each other. While there are still conflicts in which the international theater plays almost no role—for example, the often overlooked civil war in Morocco—even the more obscure wars have often gained more international visibility, as the combatants push their struggle onto the world stage. The conflict in East Timor, for example, quickly became an international concern, in large part due to the efforts of the Timorese separatists themselves. It's not hard to understand why the international theater of operations is important. Both sides stand to gain or lose supplies, training, safe havens, recruits, and military intervention by foreign powers. Both sides also can attack the other side's ability to gain these benefits. The bitter public relations campaign between Sandinista and contra leaders, fought on Nightline and other American news shows, was ultimately a battle over US aid to the contra movement. Revolutionary, internal wars and conventional, inter-state wars share another development: the increased role of private firms hired as contractors. Some of these firms are mercenaries, hired for a range of jobs from simple security (acting as bodyguards for important leaders, defending drilling rigs and mines, etc.) to combat operations. Other contractors play a host of other, non-military roles, from computer technicians to PR firms. While regimes, with more money and access to contractors, use them more widely, revolutionary groups increasingly hire their services as well. The Maoist "war from the periphery" now has been astoundingly ubiquitous, which has given Maoist practitioners the opportunity to test and refine their methods in dozens of conflicts in the Americas, Africa, Europe, and Asia. As a result this revolutionary strategy has seen more distinct innovations than the other types, which have had fewer laboratories in which to improve. Humanitarian aid. The international dimension of revolutionary warfare has created an ugly new trend in Maoism: the use of foreign aid as a weapon. In the horn of Africa especially, the regime and insurgents have blocked the delivery of food and medicine to hold entire populations hostage to their causes. Child soldiers. An equally brutal trend is the decreasing age of combatants. Many regimes draft teens and pre-teens into military and paramilitary service. The same trend exists among many guerrilla organizations, and some insurgents have been particularly ruthless in recruiting children. 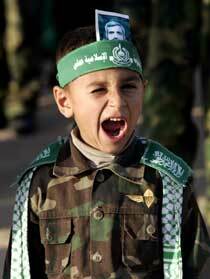 Children provide cheap cannon fodder, and they can be more easily controlled than many adult recruits. Some countries have an unfortunate combination of a low average age, somewhere in the teens, and a large refugee population. For guerrilla organizations in these countries, such as Somalia, these conditions have created a large population of teen and pre-teen recruits who are already radicalized by growing up in refugee camps. Crime. To fund the revolutionary movement, a large number of revolutionary groups have either collaborated with criminal enterprises or taken them over altogether. For example, Sendero Luminoso in Peru imposed a tax on drug manufacturing and shipment in areas they controlled. The mujahideen leaders fighting the Soviet military and Afghan Communist regime became deeply involved in the opium trade. The bloody struggle in Sierra Leone became intertwined with the illegal export of diamonds. In some occasions, guerrillas seem to have abandoned their revolutionary goals altogether, seduced by the vast profits that can be made from criminal ventures. Front organizations. Maoists have developed rather sophisticated techniques for maintaining political front organizations. As discussed in an earlier post, the exact relationship between the military and political wings of a revolutionary movement may be hard to discern—which, for the overall guerrilla organization, can be an advantage. 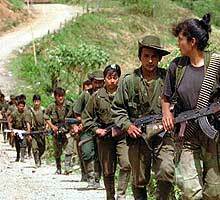 Political front organizations can confuse outsiders about the guerrillas' real intentions. Political fronts, which can easily transform into political parties, provide a face-saving mechanism for when guerrilla leaders decide to lay down arms as part of a negotiated settlement. The Leninists have faded into the background as their noisier, more violent cousins have increasingly dominated the news. However, Leninists have made some important innovations in the last several decades that have increased their effectiveness. More inclined to return to normal politics. Although warfare is supposed to be the handmaiden of politics, many revolutionary groups have a hard time giving up the fight, even if the odds of winning their political objectives are higher through non-violent means. A prime example was Yassir Arafat's decision to drop further negotiations and instead back the Al Aksa intifada. (Whatever you think of the Barak government's offer, the Palestinians have gained practically nothing through the second, more violent intifada.) However, Arafat was the exception to the rule. Most revolutionary groups, and particularly Leninist groups, have learned how to shift from the violent struggle to the negotiation table or the ballot box. More distance from terrorists. Earlier, I was careful to delineate the critical differences between Leninist and terrorist revolutionary strategies. It can be very easy to confuse the two--which, in fact, has proven the case in both political practice and political science. Because Leninist groups don't want to be tarred with the same brush as terrorists, Leninist groups have themselves taken pains to demonstrate where they part company with terrorists. For example, some Chechen separatist groups condemn terrorist operations like the Beslan incident, even though they still believe in violent action against Russian occupiers. Greater comfort with international audiences. While nearly all contemporary revolutionaries carry their fight to the international political theater, some do it with greater skill than others. Leninist groups in particular have proven more successful, on average, than Maoists or Leninists. For example, the Sandinistas, both in and out of power, were some of the most impressive media warriors in the last fifty years. In contrast, Al Qaeda's plan to intimidate the United States through the 9/11 attacks backfired. Rather than dropping support for the Saudi Arabian and Egyptian regimes, the United States moved swiftly to topple the Taliban regime and eject Al Qaeda and Taliban fighters from most of Afghanistan. Since Leninists have an urban focus, putting them more in contact with global culture and media, they understand international politics better than other types of revolutionaries. In toto, the strategic innovations terrorist have made in the last four decades have dark consequences. Terrorist attacks are deadlier and more difficult to prevent, and terrorists groups have become harder to eradicate. Shift to soft targets. An increasingly smaller percentage of terrorist organizations pick government targets for an obvious reason: they are better defended than civilians. Kidnapping or assassinating a government official also generates less terror than targeting an innocent bystander. The trend, therefore, has been away from a mix of Leninist and terrorist tactics towards a purely terrorist strategy. Suicide attacks. One of the most obvious changes in terrorist strategy is the increased reliance on suicide attacks. One of the chief problems for terrorist planners was determining the escape route after a kidnapping, hijacking, or bombing. Suicide attacks eliminate that part of an operation, making it easier to plan more operations and execute them more successfully. Increasing casualties. Overall, the number of casualties per terrorist incident has increased. Suicide attacks have contributed to this trend, as have refinements in the methods for acquiring, building, and detonating explosive materials. The 9/11 attacks were only the most tragic example of another innovation, turning airplanes into weapons. Following this line of terrorist thinking, there are equally creative ways in which subway trains, above-ground trains, ships, and other vehicles might be used as tools of mass execution. What has not occurred—perhaps not surprisingly—is the successful use of biological, chemical, and nuclear weapons. The technical expertise, raw materials, manufacturing equipment, and delivery mechanisms for unconventional weapons are hard to acquire. Since terrorists can achieve their goals with C-4 and box cutters, they don't need to make these costly, risky investments. Networks, not bureaucracies. Although Al Qaeda has taken the transformation to a network further than most other terrorist groups, it's not the only one that has concluded that hierarchical, centrally-directed terrorist organizations are more vulnerable than amorphous, decentralized networks. These days, the United States is primarily interested in counterinsurgency and counterterrorism. While the Reagan Administration experimented with an aggressive "proinsurgency" doctrine in Afghanistan and Nicaragua, the traditional goal of the United States in internal wars is (1) allied regimes against revolutionary organizations, or (2) the suppression of anti-government forces within US territory. What does this emphasis on counterinsurgency and counterterrorism mean for US foreign policy? While you can't surrender the initiative in any type of warfare, you really can't lose it in a species of conflict that mutates nearly every year. US strategy, therefore, must deal with terrorists as they fight today and tomorrow. The most important counterterrorism tool the US government doesn't yet have is not a change to the wiretapping laws, a reorganization of the Homeland Security bureaucracy, or a new fleet of Blackhawk helicopters. Instead, it's a combination of human intelligence, about which we've all heard a great deal, and better "red team" thinking, about which we've heard very little. To anticipate the next evolution of revolution, we need accurate, timely information on what revolutionaries are doing right now. We also need to give the people who put themselves in the mind of the enemy the latitude, respect, and resources they deserve. Operationally, you find these people in the intelligence agencies doing analysis, in crisis simulations playing the part of the "red team," and in the military's combat commands speculating on the next move of Al Qaeda, the FARC, and the Sudanese militias. They're also the people who often give their superiors unwelcome advice—unwelcome, perhaps, because they more closely approximate what the real enemy will do than a scripted exercise. The other change, at a broader level, is cultural, not bureaucratic. If the 9/11 attacks "changed everything," then Americans have to stop living as though their own culture is the only one worth understanding. Americans are astonishingly parochial, with poor foreign language skills and often no experience traveling or living abroad. If the country, not just a segment of the executive branch, is really at war, then this generation's version of the scrap metal drive or victory garden may be a better education in the history and culture of the Muslim world. In a democracy, we can only hold our leaders accountable for success in counterterrorism if we have some idea what it takes to stop people from joining, supporting, or tolerating terrorist groups who may attack American targets. Read a book on the topic. Visit your local mosque. Invite a Muslim acquaintance or co-worker to lunch. While I just railed against American insularity, this education involves a small amount of self-examination. In the last four years, the term "terrorism" has become synonymous with foreign terrorists. That's a dangerous oversight, since there are other potential Timothy McVeighs in our midst. We need to face the nature and scope of domestic terrorism, and at the same time glean whatever insights into Osama bin Laden that Timothy McVeigh can provide. Thanks for some fine analysis and sage advice. For whatever reason, however, I think you fail to concentrate on a key aspect of revolutionary movements of various stripes: their tendency to depend upon the support of rogue states (like Syria or like Iran with respect to revolutionary movements in Iraq) or rogue elements within states (like the Revolutionary Guards in Iran, like Khan of Pakistan). There is an analogy here to the support that totalitarian states like Sudan and Zimbabwe receive from other totalitarian states (like China). This aspect is important because, for the simple reason of symmetry, a state (and a State Department) has more leverage over a state than it will ever have over a revolutionary movement, short of physically annihilating its adherents (not very practical anyway). Another aspect that deserves further elucidation is the role of ideology (religious or political or both) in driving a revolutionary movement. There is a sense in which an ideology, for example, Marxism, can lose its appeal when it so obviously is not a "strong horse" anymore. Conversely, the real and often sole purpose of terrorist activity is to give the impression that a particular ideology is a strong horse. The utter failure of totalitarian revolutionary movements to achieve their goals needs to be stressed relentlessly. Apparent cases to the contrary (Iran, Cuba, China, North Korea, Zimbabwe) need to be deconstructed in a myriad of ways. OK, I will admit it. I do not know anything about a civil war in Morocco. You said it was often overlooked. Apparently so. What is/was the civil war in Morocco? Why is/was there no international dimension? 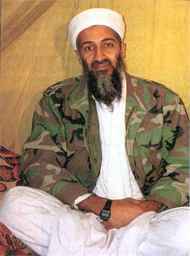 "Al Qaeda's plan to intimidate the United States through the 9/11 attacks backfired. Rather than dropping support for the Saudi Arabian and Egyptian regimes, the United States moved swiftly to topple the Taliban regime and eject Al Qaeda and Taliban fighters from most of Afghanistan." What about Al Qaeda's involvement, on September 10, 2001, in the assassination of Massoud, a leader of the Northern Alliance? I always thought this meant that Al Qaeda anticipated direct US intervention in Afghanistan after 9/11 and moved to decapitate the man who, at the time, was seen as the most likely alternative to the Taliban leadership. "Since Leninists have an urban focus, putting them more in contact with global culture and media, they understand international politics better than other types of revolutionaries." Secondly, is your statement (or, for that matter, my reversal of it) true independent of the very international connections that your post is focused around? That is, if you take the Sandinistas to be the model of the movement that understands how to work within the Western media world, is that because they were (I would say still are) Leninists, or because they were being advised by, and sought to integrate with, the Soviet and Castroite world, which was itself urban and modern? That is, assuming there are non-Soviet-line Leninists (are there?) do they necessarily share this media sensitivity? I am skeptical that they necessarily go hand in hand. In the end, your stament about Leninists implies that they are not so revolutionary after all--which is precisely what the Maoist critique was all along. Yeah, Matt, I agree--certain groups choose the Leninist path because they're already urbanites. That was certainly the case, say, with the Tupemaros and other Latin American groups like them. It's that much more impressive, therefore, when people from that background take to the hills to pursue a Maoist campaign. As for the Sandinistas--I don't think the advice they got from the USSR and Cuba was as important for their outlook as, say, their utter failure to pull off a foco strategy. Either they lacked the skills to build more than a nominal guerrilla force, or Nicaragua was the wrong place to pursue a Maoist strategy. Either way, they got their nose bloodied a couple of times and found the other approach more productive. Thanks for pushing me on these points, by the way. I freely admit that, because I had such a hard time writing this post, a lot of it may have been garbled. Well, the Sandinistas did not win with either the Guevarist 'foco' strategy or a Maoist one. And, sure, Nicaragua was a bad place to try to pull off a rural insurgency of any kind. By the 1970s, it was already at least half urban (as was Cuba itself in the 1950s). In both places--as political scientist Robert Dix observed--it was ultimately a sort of all-class urban insurrection against the dictator that led to the overthrow, not a classic insurgency. Where these folks showed their Leninist side was AFTER coming to power, using "salami" tactics to eliminate more liberal elements of the anti-dictator coalition bit by bit. "It's that much more impressive, therefore, when people from that [urban] background take to the hills to pursue a Maoist campaign." i am not sure what to think about this article. I will have to read it again. we overlook alot of things in this world. this is so sad to say. I like what Kingdaddy suggests,"Since Leninists have an urban focus, putting them more in contact with global culture and media, they understand international politics better than other types of revolutionaries." I found so many interesting stuff in your blog especially its discussion. From the tons of comments on your articles, I guess I am not the only one having all the enjoyment here! Parda shoes the French army would have Authentic Air Jordans to rush to plug these holes before the operationally nimble Wehrmacht could exploit them. Since the Belgian gap was a hole that already existed in the Maginot Line Wide Women Shoes Kid Kicks.